When the tantrik spits on sawdust, it bursts into flame. 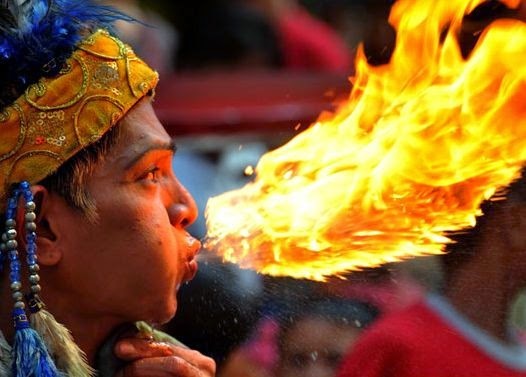 Effect: When the tantrik spits on sawdust, it bursts into flame. Props: A metal-bowl, well dried sawdust, sodium peroxide (powdered), water. Method: Keep in metal bowl dry sawdust mixed with equal parts of powdered sodium peroxide. Ask some one to bring a glass of water, drink some water and spit a small quantity over the sawdust. It will burst into flame. Effect: The oracle gets possessed and blows out sparks and flames from his mouth. Props: Jute thread, Potassium nitrate solution, cotton. Method: Dip the jute thread in potassium nitrate solution four times, drying it each time. Light one end and make it into a ball with cotton wrapped around and place it in your mouth while acting as if to wipe your mouth. Breathe out in steady stream and sparks and flames will shoot out of your mouth. While keeping the ball in your mouth let there be enough saliva in your mouth. When it gets a little hot, remove it under cover of your handkerchief. While the ball is in the mouth do not inhale. Note: The image appearing along with this article is only for representative purpose. The spitting of fire shown here might not have been made as per the method explained in the article. The tricks/stunts are explained here for debunking the so-called miracles. They should be performed only under expert guidance and should not be performed on one’s own. The author or the web administrator will not be responsible for any adverse consequences if so performed without expert guidance. Is the Face of Hinduism Changing?